To directly connect your headset to specific Avaya IP phones, including the following models: 2410, 2420, 4406, 4412, 4424, 4406D+, 4412D+, 4424D+, 4424LD+, 4610SW, 4620, 4620SW, 4621SW, 5410, 5420, 5610, 5620, 6416D+M, 6424D+M. The Quick Disconnect (QD) capability allows the headset to detach without losing the call. 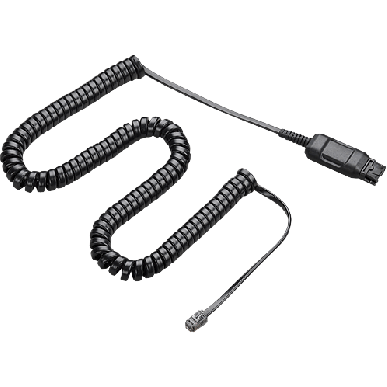 This cord is all that is needed to connect a Plantronics H-Series Headset to many Avaya phone models.